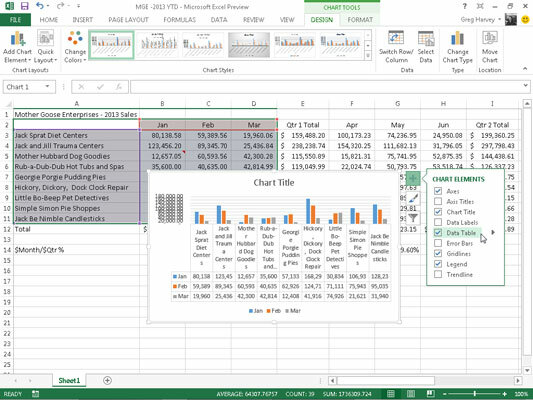 The Chart Elements button (with the plus sign icon) that appears when your chart is selected in Excel 2013 contains a list of the major chart elements that you can add to your chart. To add an element to your chart, click the Chart Elements button to display an alphabetical list of all the elements, Axes through Trendline. More Options to open the Format Data Labels task pane where you can use the options that appear when you select the Fill & Line, Effects, Size & Properties, and Label Options buttons under Label Options and the Text Fill & Outline, Text Effects, and Textbox buttons under Text Options in the task pane to customize any aspect of the appearance and position of the data labels. This data table includes the legend keys as its first column.